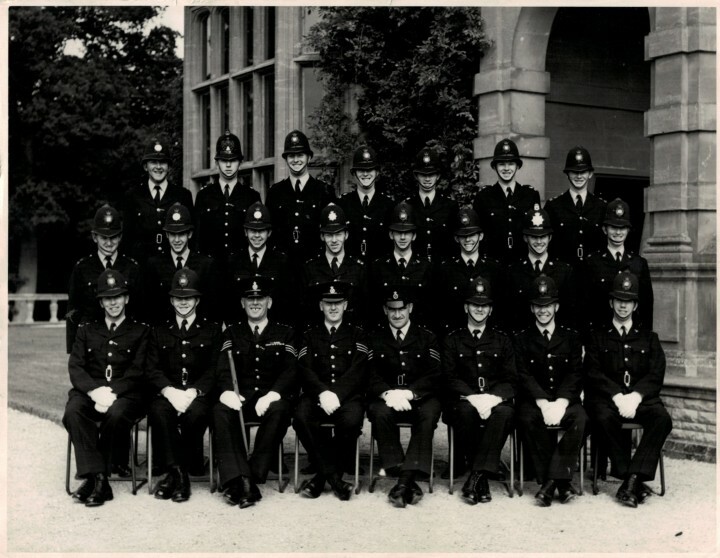 Number 5 District Police Training Centre at Eynsham Hall trained officers mostly from the east of England in a triangle stretching from the Wash to Oxfordshire and then east to Essex, including the City of London Police. I attended Course 191 from June to September 1962 and this photograph shows Class “F” at the end of our 13 weeks of basic training – which was followed by two two week Continuation Courses towards the end of one and two years service. Front row: ?, Stan York (Herts. ), P.s. Vincent (Isle of Ely) [Drill and First Aid], P.s. “Taffy” Thomas (Bucks.) [General Instruction], P.s. Flint (Beds.) [P.T. & Self Defence], Spurling (Ipswich), Dave White (Herts.). Centre row: Pritchard (Beds.? ), Graham Warne (Oxford City), Bill White (Oxford City). Pete Toons (West Suffolk), Mick Preecey (Herts. ), Derek “Del” Passey (Herts. ), Mansfield (Southend-on-Sea), John Weeks (Herts.). Back row: Chris Payne (Oxford City), Richardson (City of London), Brian(?) Reynolds (Essex), ?, Pigney (Essex), ?, ?. This page was added on 29/11/2015.